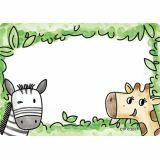 These cute Safari Friends Labels are ideal for name tags and for use as labels around the classroom. Use them as name tags for the first day of school, field trips, open house, back-to-school night, parent visitations, class parties, new students, and more! Or use these colorful labels to organize your classroom. They are great for labeling storage bins, folders, binders and cubbies. 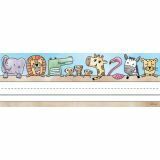 The cute safari design makes them versatile for use in a variety of classroom displays and themes: science, nature, adventure, exploration, outdoors, the zoo, and animals. 9.5" x 3.25". 36 name plates per package.